Almond wood table center- I cut this slab from an almond trunk that hadn’t been removed yet from the orchard. It was a unique project to make in that the wood is not perfectly level; the base sits level because of 1” almond plugs glued in the bottom. I have really begun to enjoy working with almond wood as it is relatively soft. The top was smoothed out with a belt sander; it is finished with Howard Cutting Board Oil. It is 29” long, 14” wide, and 3” thick at the largest areas. All comments welcome; thank you for viewing! That’s a beautiful piece of wood. Beautiful depth and range of color in that. Thank you for the encouraging comments, BurlyBob and swirt! This is an outstanding piece of wood. Thank you, Ivan and Charles! Beautiful wood. How long did you let it dry before you sanded and finished it? Design is great also – simple and rustic but very versatile. Thanks for the comment, leafherder! As for allowing it to dry, I really don’t know. 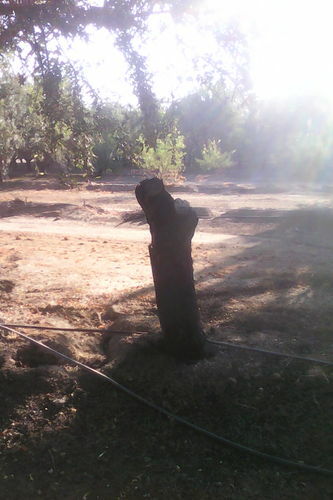 It was a slab from a trunk from a field that I work in; only the trunk was left in the ground. My guess is that it has been drying for 1-5 years; however, it was quite dry when I worked with it. Thank you for your encouragement! Thanks for the field photo, very interesting to see where the wood came from.